A couple hours ago I finished my maiden ride around the streets of Philadelphia on the famous (some might say infamous) Liberty Classic Road Race. It is hard to believe that I just did that race. It is best described as a bit surreal for me. I am still a very new rider and races like this legendary one reign high. However, make no mistake; although it did not seem real to me that I was doing this historic race, I was racing it to win it! For those of you who are unfamiliar and have not seen the cycling documentary "PRO" where Eric Saunders eloquently describes the tactics of cycling in preparation for this epic race, this race takes place in downtown Philadelphia and is a circuit through crowded streets of cheering fans. The women's field only does four laps of the course, but it features the notorious Manayunk hill, a short climb that pitches up to 17% and it separates the wheat from the chaff. After the Manayunk "wall", the race wraps around, has two more little punchy hills (Strawberry Meadows and Lemon Hill), and then it zips into the finish for a straight drag racing sprinter's finish. The race was incredible! The streets were lined with cheering fans and the course was my idea of the perfect race: flat enough that I could hang on but hard enough to make it a race and make it interesting. Because the field is very big and very aggressive, it is a famously dangerous race where positioning is everything. Everyone has one goal: be in the top few riders as you hit the base of the hill so that you are not gapped behind riders being dropped as the race is constantly shattered up the climb. However, there are 110 riders all with the same goal. We had been warned about the dangerous lap one crashes and our team was working hard to be in front. The first lap actually went fairly well, save for a small mechanical mishap that landed me on the side of the road and chasing in the first mile. Fortunately, it was easily fixed (my magnet had come loose and was hitting my speed sensor on my computer), and I was able to move up. Moving up takes a lot of focus in a field like that. Riders are anxious and riding close together. 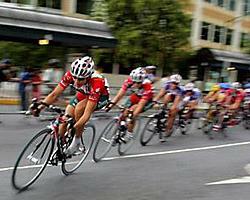 There are often near misses and bobbles, shouts in the peloton and nervous slamming of breaks. In all seriousness though, when I realized that I really only needed to focus on a small area for staying upright, it freed me and made me much more relaxed on the bike. Now, I when I am hit hard from the side or from behind I do not think twice about it. I keep looking forward for the flow of the race and where to move up on the sides, as well as where to take advantage when riders in front of me have allowed for too much space in front of them, permitting me to slip ahead without spending energy in the wind. I am aggressive about moving up. I have to be. I am a sprinter. That is what we do. So, on the first lap, I was able to move up into great position on the base of the hill in time to see Kristin Armstrong (TEAm Lipton) launch into a hard attack for the QOM and a successful attempt to rip the field apart. Kristin's attack shattered the field and lead to a break of seven riders, but with the entire flat and downhill, the bunch came back together and everyone seemed content to ride along and wait for the next hill to come. Being a sprinter and having our team strategy to bring me to the line, I had great teammates babysitting me and making sure that I was protected and not pulling to close any gaps that opened up in front of me. They did a great job! The second climb came and I moved up as Kristin launched another powerful attack for the QOM. It was clear that Kristin came to race her bike, but none of the other climbers or teams seemed content to work with the breaks . I confess my disappointment that the other teams were not more aggressive. Being a smaller and younger team, we were not yet in a position with our riders to be controlling this race by attacking. We had anticipated attacks from Webcor, Lipton, T-Mobile, Nurenberger, Aarons, Colavita... etc. But in the end, save for a great attack by Alison Powers of Colavita on the second to last lap where she was solo for quite a while, there was really not much happening between the climbs. Although I am a sprinter and wanted a bunch finish, I wanted a hard race and one where all the strong teams were using their full strength in a tactical chess match of power and strategy. Alas, Lipton was aggressive on the climbs and doing a great job of racing their bikes, but everyone else seemed to be happy to have a bunch sprint. I did have one rather exciting moment, but not exactly the kind of excitement that I had been looking for! As I had mentioned before, positioning is critical when heading into the Manayunk wall - especially for sprinters who need to be up front to make it over the top in the lead group. I am sure that I was not the only rider there who was getting an earful of "You have GOT to move up and be top five at the base of the climb. MOVE UP!" It really helps to have radios. Sometimes you need to hear what you already know. I am sure that they were getting word from their directeurs to do the same thing I was being told to do. We were heading into the last kilometre before the climb when there was a right hand corner with a curb. Alison Powers, who is a large rider, like me, and a great bike handler was on my left. I was closing in on the corner and not giving much room when German powerhouse sprinter Ina Teutenburg came flying into the corner and slamming into me. I was squeezed between Ina and Alison as Ina took the corner inside the two of us. She had no room to move or she would go down on the curb. As it was, she barely skidded along the inside of the curb. I could see a light post and a lot of concrete and I thought for sure I was about to go down in a big pile of carbon fibre and pain. I was pinched hard against Alison and thankfully, it was her. I know her well and know how well she can handle her bike. I thought to myself, "Here it comes!" My foot came unclipped and my leg flailed after hitting my stem hard. Somehow, I did not go down. I am not sure how. The road then straightened out and I refocused and moved right up into position in front of pack. Ina later apologized for the move. I am just glad that it was the three of us and not some other riders. I trust myself on a bike and trust both Ina and Ali. They know what they are doing. The rest of the race was, as I said before, a bit uneventful. It was a bit of a disappointment for such a highly anticipated race as this one. I was able to mark the sprinters (the top European-guns) who I was particularly focused on: Ina, Regina Schleicher and Joanne Kiesanowski and I followed them to the line. My goal had been to be third wheel coming around the final turn, which was still 600 metres or so to the line. As we headed into the last one kilometre of the race, I had moved up and I was mostly where I wanted to be. I heard a horrible crash behind me, with the sound of breaking of bike parts and the skidding of metal and bodies as they slid along at top speed. I heard later that everyone involved ended up OK. I guess that there were some aggressive sprinters jockeying too hard for position. I moved into position and fought Ina's sweep with my elbows, her teammate Kate Bates, to get on Ina's wheel as we came around the corner. I was right where I wanted to be after having to work hard for that coveted position. I was excited and trying not be too impatient. My goal was to be in position and calmly read the sprint as it unfolded. In the end though, I ended up not being ready as Kate attacked along the right side behind me setting Ina up to get on Regina's wheel as she covered the move. I missed the move and jumped too late and not hard enough. I was disappointed that I lost my position in the final stretch, and in the end I finished eighth but I am learning. I have to remember that this is still my first time getting up there and doing battle with riders of their calibre. I still love every minute of it!